I still have 2-3 more posts to do on the Seoul Summit over at One Free Korea and will post a few random thoughts on it here later in the week. But I have to catch up on a backlog of work for the next few days, so blogging will be light to nonexistent until Thursday or so. 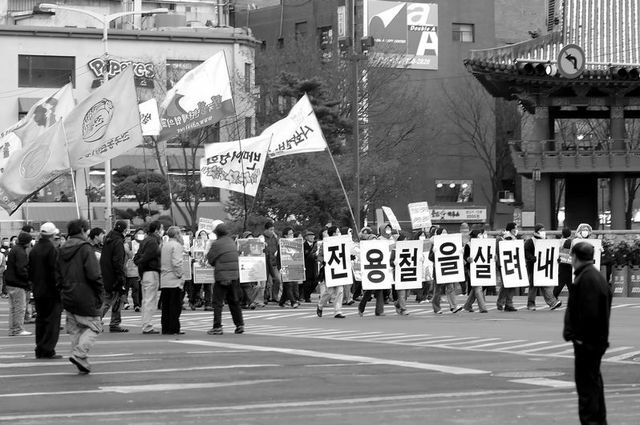 In the meantime, check out some pictures that another professor at Ansan College took last Friday of a protest by rice farmers in Seoul. Jim Kapper has a good eye and the gear to match. While you are there, check out some of his other stuff. I think that Urban Streets II is especially good as are the various nature shots.